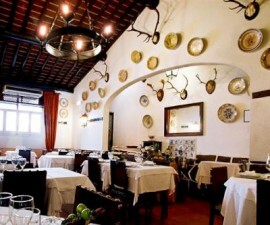 Tasquinha do Oliveira Restaurant in Évora is considered to be one of the quirkiest eateries in this historic UNESCO World Heritage city of central Portugal. Run by the husband and wife team of Manuel, who manages the front of house, and Carolina who creates the dishes behind the scenes in the kitchen, it is more like spending an evening in the dining room at a friend’s house than eating out in a restaurant in Évora. 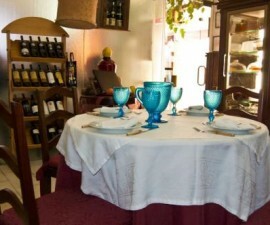 Just five tables seating a total of 14 guests are squeezed into the tiny dining room, which is delightfully decorated in the true styles of regional Portugal. 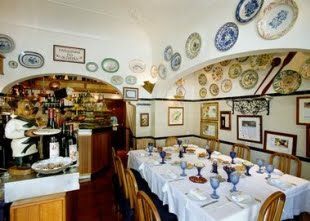 The whitewashed walls play host to framed pictures and many accolades won by the Tasquinha do Oliveira for its contribution to gastronomy in the city. When you arrive you are greeted by Manuel, who will show you to your table ready laid and set out with a selection of five or six tasty looking starters. Do be aware that, like many restaurants in Portugal, these dishes are charged for if they are eaten but if they do not all appeal then you have a right to (and indeed are expected to) ask for them to be removed back to the kitchen. Many visitors find themselves caught by this during their stay in Évora simply by not knowing the local dining etiquette. Manuel is happy to make suggestions for main courses or let you take your pick from the dishes on the menu. The partridge dishes are excellent thanks to the strong tradition of game rearing in the Évora area and the black pork and clams is a classic. Monkfish and rice is another popular favourite and there is plenty for diners to choose from to suit every palette. 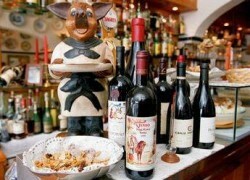 The Tasquinha do Oliveira has a large wine list that belies its small size, with bottles of every vintage from all over the country. There is a good selection of the local nectar from Alentejo region and Manuel is happy to make suggestions to suit your meal. Prices are higher than at some of the other local restaurants in Évora but then this is a different kind of dining experience. If you want to experience the delights of Alentejo cooking in a pretty environment that has the welcoming cosiness of a friend’s home, the Tasquinha do Oliveira is an excellent choice.